I recently bought a used 2003 Mazda6 1.8 gasoline and have come across a strange problem regarding the washer. It seems like the controls for the front and rear washer are swapped. When pulling the wiper handle towards you, the front wiper starts, but washer liquid is sprayed on the back windshield. When twisting the "back wiper" knob, washer liquid is sprayed on the front windshield without activating the wipers. I have a theory that there might have been a connection error after a washer pump change. Do anyone have experience with changing the washer pump, and is this a plausible theory? Is there a simple fix to the problem? The Mazda 6 never came with a 1.8L. 2.3L 4 Cyl and 3.0L V6. Do you have the Hatchback or Wagon? Regardless, it sounds like they have the rear and front washer motors backwards. Probably just plugged in wrong. 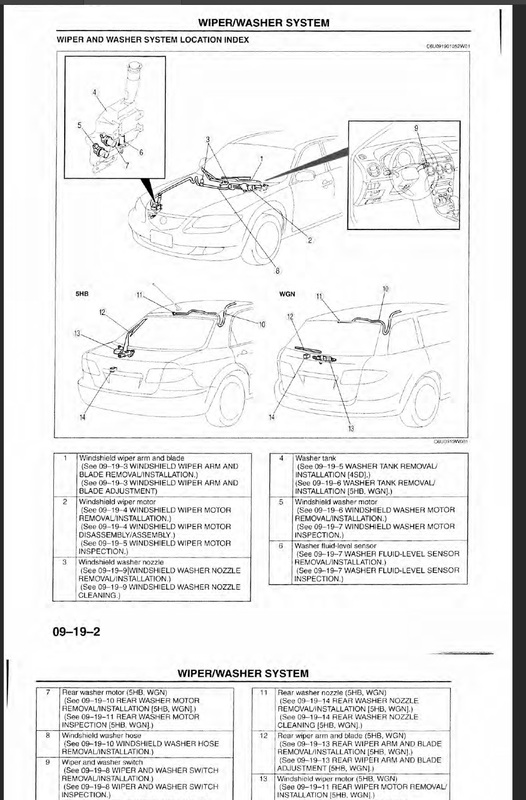 I've attached a screen shot of the service manual, outlining the connections. You want to look at #5 and #7 . Easiest way to gain access to this is under the passenger front bumper, between the wheel and bumper. You should see 3 or 4 screws on a black panel. Once removed, that panel should drop down, giving you access to the reservoir. Try changing the connectors (pull #7 , put it where #5 is, and vise-versa). Hopefully that'll clear it up. Thank you for the help. The electric contacts are not interchangeable, but I guess that the second best alternative is to to just switch the outflow tubes. I hope, and think, that that will solve the problem. It's a wagon, btw. There is a 1.8L, 2.0L plus a 2.0L diesel in other countries. North American only got the 2.3L/2.5L and 3.0L/3.7L engines. This is likely the solution. Someone probably removed the washer bottle for some reason and mixed up the hoses when they reinstalled it. It's a simple fix. In other news, I have a wagon love thread where I'm trying to get photos of all the wagons I can on there. Head on over and post up a couple pictures of yours when you have a chance. We'd love to see it. Wagons are a rare breed over here and for those of us who are fans, we get pretty excited to see them.